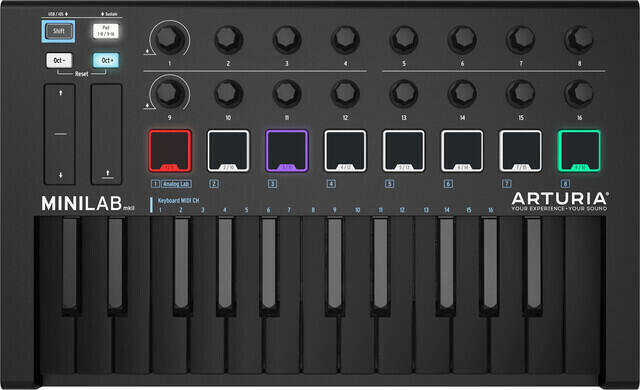 Compact Keyboard and Pad Controller with 25 synth-action mini keys, 4-way thumbstick for dynamic pitch and modulation control, 8 backlit velocity-sensitive MPC-style pads, 8 assignable Q-Link knobs for mixing and tweaking plug-ins, Built-in arpeggiator and Dedicated Octave Up and Octave Down buttons. The device is USB-powered, so it does not requier a power adapter. The keyboard/pad controller also features a full-size sustain pedal input jack and Akai Pro MPC Essentials, SONiVOX Wobble, and Hybrid 3 by AIR Music Tech software is included. The dimensions of the device are 317 x 181 x 44 mm and the weight 0,75kg. Color: Limited Edition White. Do you own Akai MPK2 Mini White Limited Edition or have you had a chance to try it? Ár/érték arányban szuper termék! A limitált kiadású verzió pedig kinézetre is különleges.